The abrupt collapse of a three-foot wall and the boulder upon which it was constructed has left two families on edge with apprehension that their homes will eventually lose foundation and give way altogether. The incident took place at a community in Flanker, St. James, on Wednesday March 27 at 2:30 a.m. and involves 2 houses, one of which is located on top of a hill, while the other is situated at the bottom. Separating both houses is a three-foot wall which sits on top of a large boulder. 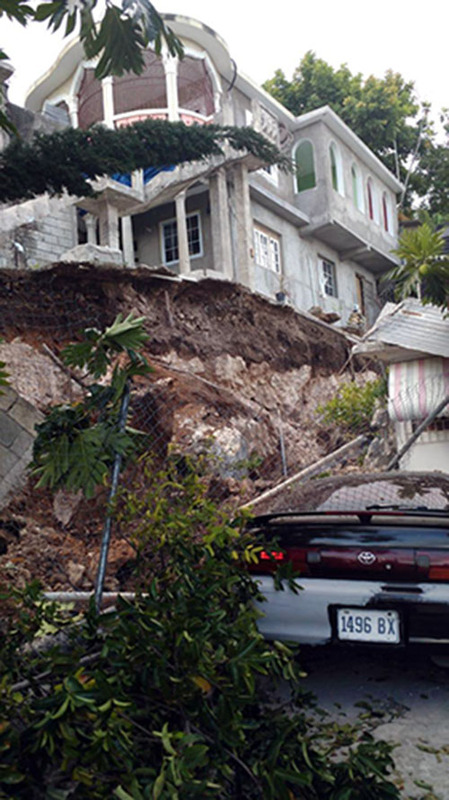 Accounts from one of the residents, Doreen Willocks, 62, who lives in the 2-storey house on top of the hill, are that she awoke to crashing noises and slight shakings. Upon rushing outside, Willocks and the other occupants of her house, including her neighbours, witnessed the ordeal. The wall capsized and crashed onto the structurally compromised rock. The impact of both structures is believed to have severely weakened the foundation of the homes involved. The landslide-like disaster lasted for all of 16 minutes. “Right now I don’t like to talk about it. Part of the back is still breaking away and some more sections have cracked since the incident took place. The column on the steps are now cracked and could break away easily, especially if rain falls,” said a tearful Willocks. While there are cracks to the foundation of Willocks’ house, the columns threaten to give way and the side of her house sits vulnerably at the edge overlooking what now lays the remains of the wall and rock. Her neighbours were also left to suffer as the crumbling rock and wall caved in on their kitchen and car. It is believed that the five (5) occupants of that house still live there. As for Willocks, she has since relocated to the other house in her yard which belongs to her daughter who no longer resides there. Her 2-storey home was initially occupied by herself, her husband Leroy Willocks, 74, their daughter-in-law Annakay Lewis and the 4 children she shares with their son who lives overseas. Lewis and the children now occupy the second floor of Willocks’ house. “We are scared right now because some more break off yesterday. It’s like a little piece keeps breaking off as the days go by. It’s definitely not safe because that tells us that more is gonna happen,” admitted Lewis. It is unclear what caused the rock and wall to collapse, but Willocks and Lewis believe that it may have been due to tampering of the rock. Councillor Charles Sinclair visited the scene of the incident along with National Works Agency (NWA) personnel whom he tasked with developing a plan and cost to the solution. “The matter is technically a government matter because it touches upon the lives of individuals. Damage I saw is dangerous and very costly because of the danger people are exposed to,” said the government senator. Sinclair assured that he will endeavour to secure funding to rectify the situation. “I will try advocacy to see how they can be rendered assistance through public sources to alleviate the danger that exists,” he said. “I am anticipating a report from the superintendent,” he added.